Paula Deen Sweet Bourbon Glaze 12 oz. Home / Pantry Items / Condiments, Sauces, Dressings, & More / Barbecue Sauces / Paula Deen Sweet Bourbon Glaze 12 oz. 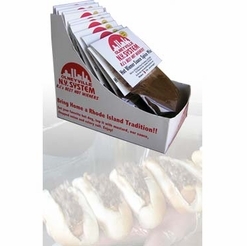 Home / New England Classics / Condiments, Sauces, Dressings, & More / Barbecue Sauces / Paula Deen Sweet Bourbon Glaze 12 oz. Home / Hot GIFT Ideas / Gifts For Him / Party Favorites / Condiments, Sauces, Dressings, & More / Barbecue Sauces / Paula Deen Sweet Bourbon Glaze 12 oz. Home / BBQ & Grilling / Condiments, Sauces, Dressings, & More / Barbecue Sauces / Paula Deen Sweet Bourbon Glaze 12 oz. Home / Hot GIFT Ideas / BBQ & Grilling / Condiments, Sauces, Dressings, & More / Barbecue Sauces / Paula Deen Sweet Bourbon Glaze 12 oz. Home / Hot GIFT Ideas / Gifts For Him / Party Favorites / BBQ & Grilling / Condiments, Sauces, Dressings, & More / Barbecue Sauces / Paula Deen Sweet Bourbon Glaze 12 oz. Home / Specialty Grocery / Condiments, Sauces, Dressings, & More / Barbecue Sauces / Paula Deen Sweet Bourbon Glaze 12 oz. Home / Foods of New England / Condiments, Sauces, Dressings, & More / Barbecue Sauces / Paula Deen Sweet Bourbon Glaze 12 oz. 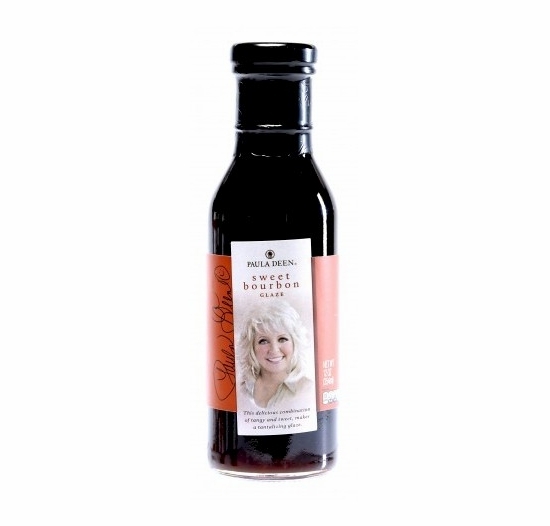 Home / Celebrity Chefs / Paula Deen / Paula Deen Sauces & Dressings / Paula Deen Sweet Bourbon Glaze 12 oz. Home / Hot GIFT Ideas / Senior Gift Ideas / Paula Deen / Paula Deen Sauces & Dressings / Paula Deen Sweet Bourbon Glaze 12 oz. Home / Pantry Items / Condiments, Sauces, Dressings, & More / Barbecue Sauces / Paula Deen Sauces & Dressings / Paula Deen Sweet Bourbon Glaze 12 oz. Home / New England Classics / Condiments, Sauces, Dressings, & More / Barbecue Sauces / Paula Deen Sauces & Dressings / Paula Deen Sweet Bourbon Glaze 12 oz. Home / Hot GIFT Ideas / Gifts For Him / Party Favorites / Condiments, Sauces, Dressings, & More / Barbecue Sauces / Paula Deen Sauces & Dressings / Paula Deen Sweet Bourbon Glaze 12 oz. Home / BBQ & Grilling / Condiments, Sauces, Dressings, & More / Barbecue Sauces / Paula Deen Sauces & Dressings / Paula Deen Sweet Bourbon Glaze 12 oz. Home / Hot GIFT Ideas / BBQ & Grilling / Condiments, Sauces, Dressings, & More / Barbecue Sauces / Paula Deen Sauces & Dressings / Paula Deen Sweet Bourbon Glaze 12 oz. Home / Hot GIFT Ideas / Gifts For Him / Party Favorites / BBQ & Grilling / Condiments, Sauces, Dressings, & More / Barbecue Sauces / Paula Deen Sauces & Dressings / Paula Deen Sweet Bourbon Glaze 12 oz. Home / Specialty Grocery / Condiments, Sauces, Dressings, & More / Barbecue Sauces / Paula Deen Sauces & Dressings / Paula Deen Sweet Bourbon Glaze 12 oz. Home / Foods of New England / Condiments, Sauces, Dressings, & More / Barbecue Sauces / Paula Deen Sauces & Dressings / Paula Deen Sweet Bourbon Glaze 12 oz. Home / New / Paula Deen Sweet Bourbon Glaze 12 oz. Delicious on pork chops, salmon, or mixed in with fried/steamed vegetables! This delicious combination of tangy and sweet, makes for a tantalizing glaze! Fat Free, Cholesterol Free, Vey Low Sodium. Ingredients: dark brown sugar, apple cider vinegar, soy sauce (ater, wheat, soy beans, salt), onions, water, bourbon, garlic, pepper sauce (vinegar, red pepper, salt), modified food starch, lemon juice concentrate, molasses, natural butter flavor, glucono delta-lactone, less than 1/10th of 1% sodium benzoate added as a preservative. Contains wheat, milk and soy. Paula Deen Tangy Moppin' Sauce 12 oz. Paula Deen Honey Habanero Barbeque Sauce 12 oz. 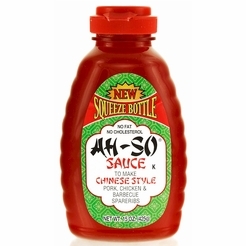 Ah-So Original Chinese Style BBQ Sauce 15 oz. 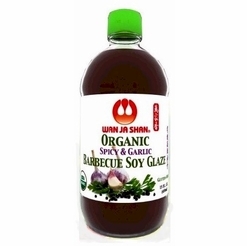 Wan Ja Shan Organic Gluten Free Spicy & Garlic BBQ Soy Glaze 15 oz.